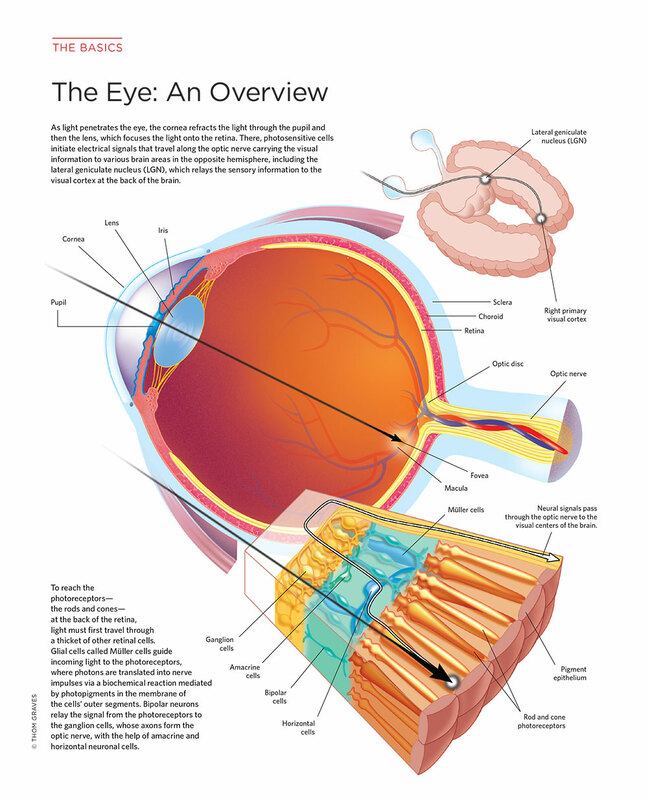 See full infographic: JPG | PDF© THOM GRAVESAs light penetrates the eye, the cornea refracts the light through the pupil and then the lens, which focuses the light onto the retina. There, photosensitive cells initiate electrical signals that travel along the optic nerve carrying the visual information to various brain areas in the opposite hemisphere, including the lateral geniculate nucleus (LGN), which relays the sensory information to the visual cortex at the back of the brain. To reach the photoreceptors—the rods and cones—at the back of the retina, light must first travel through a thicket of other retinal cells. Glial cells called Müller cells guide incoming light to the photoreceptors, where photons are translated into nerve impulses via a biochemical reaction mediated by photopigments in the membrane of the cells’ outer segments. Bipolar neurons relay the signal from the photoreceptors to the ganglion cells, whose axons form the optic nerve, with the help of amacrine and horizontal neuronal cells.